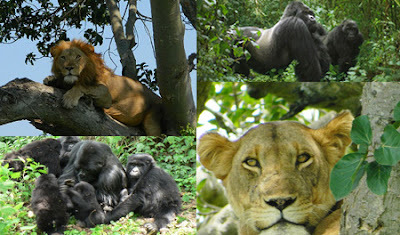 This 6 days private Uganda Gorilla, chimps and Wildlife Tour itinerary offers you an opportunity to look into the eyes of the endangered Mountain Gorilla in the dense forests of Bwindi impenetrable national park and see abundant savannah wildlife and Chimpanzees in Queen Elizabeth and kibale National parks. It is tailor-made and therefore subject to adjustment upon the client’s request to accommodate special interests. The tour starts from Entebbe airport to Kampala, Bwindi NP, Queen Elizabeth NP and Ends in either Entebbe or Kampala depending on the client’s departure schedule. Wake up early morning, breakfast and after we drive off to Bwindi Impenetrable Forest for tracking the mountain gorillas. The journey is exciting with beautiful views to see, the vehicle can be stopped at any time to take good pictures. Have lunch in Mbarara and continue to Bwindi impenetrable national park, we arrive late and check in to your preferred lodge. Day 4: Morning Game Grive and Chimpanzee Tracking. Very early in the morning, your will transfer for a game drive along Kasenyi track in quest for Africa lions, leopards, elephants and buffaloes among others, come back to the lodge for late breakfast and unwind as you wait for lunch. Toward the afternoon, go to Kyambura gorge for chimpanzee tracking where you will additionally encounter others primates, for example, the baboons, colobus monkeys, vervet monkeys among others. Return to the lodge for dinner and overnight stay. After an early cup of coffee, you will go for chimpanzee tracking in Kyambura. Your trek may be captivated by the sights of other primates like Black and white colobus monkey, grey-cheeked mangabey, and a number of bird species. Return to the lodge for lunch and later embark on a community visit to how local people live and there will be some entertainment form the locals plus souvenir. overnight stay. Tour cost includes: Gorillas tracking permit, all park entrance and related fees, chimp permits, boat fees, Full board accommodation with all meals (breakfast, lunch and dinner), bottled drinking water on safari, private 4x4 ground transportation with an English speaking driver guide, guides in national parks. Excluded: Flight tickets and departure taxes, travel documentation (visas), travel and medical insurance, optional excursions, tips and gratiuties for your guides and accommodation staff, Laundry, beverages other than mineral water in the vehicle and at meal times with meals, -Items of a personal nature such as telephone calls, postage fees and so on.